The Illinois Tollway is scheduled to complete local crossroad bridge repair work on 47th Street in September and then begin work on the 55th Street over the Tri-State Tollway (I-294), as well as 55th Street bridges over Flagg Creek in Cook and DuPage Counties. Electronic message boards and construction signage will be put in place in advance to alert drivers to the start of bridge repairs and new traffic patterns. In the early morning of Friday, Sept. 14, all lanes on the 47th Street Bridge carrying traffic over I-294 are scheduled to reopen. Once that is complete, traffic on each of the 55th Street bridges is scheduled to be reduced to one lane in each direction and shifted. Repairs on all of the 55th Street bridges are scheduled to be completed in two stages with lane closures expected to be in place for up to three months. Please check the Daily Construction Alert for up-to-date closure information. Bridge repairs include pavement patching, bridge deck repairs, bridge joint replacement and repairs on bridge beams, piers and girders. 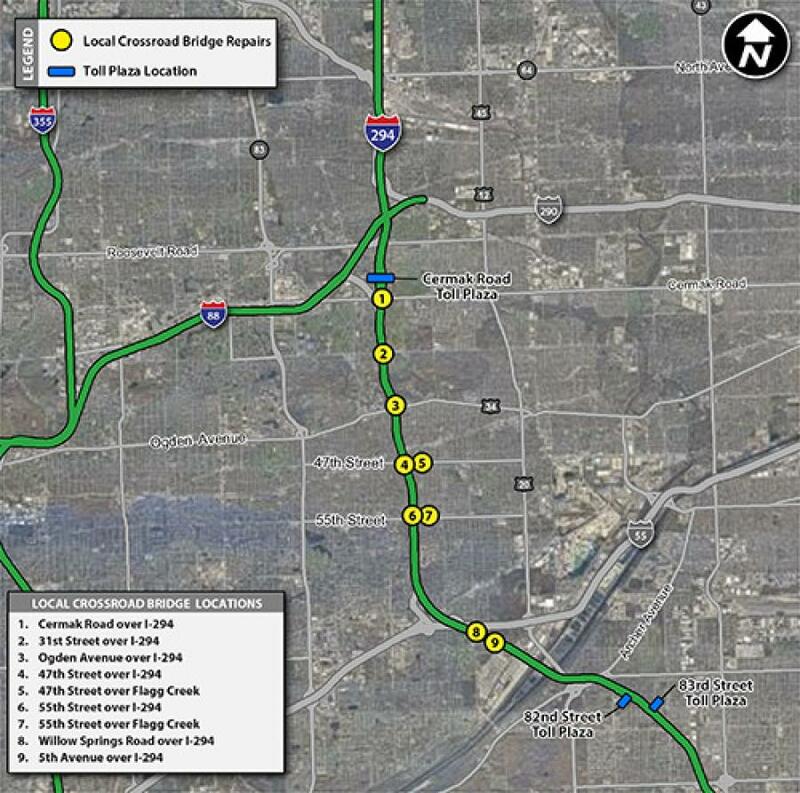 In 2018, the Illinois Tollway is repairing eight local crossroad bridges including Cermak Road, 31st Street, 47th Street, 55th Street, Willow Springs Road and 5th Avenue over I-294 and the 47th Street and 55th Street bridges over Flagg Creek. Repair work is being coordinated with the Illinois Department of Transportation, Cook County, DuPage County, local communities, as well as local fire and police departments. Information about the Central Tri-State Tollway (I-294) local crossroad bridge repairs is available on the Tollway's website at illinoistollway.com via the Interactive Tollway Map and under “Projects Overview” in the Explore Projects section. The Illinois Tollway is committed to ensuring that the Central Tri-State Tollway (I-294) and local roads remain safe for both drivers and workers during construction, which is part of the agency's overall commitment to roadway safety. Illinois State Police have zero tolerance for drivers speeding in work zones or failure to comply with the Move Over Law. The minimum penalty for speeding in a work zone is $375. Posted signs advise drivers of a $10,000 fine and a 14-year jail sentence for hitting a roadway worker. Penalties for failure to slow down or move over for a vehicle on the shoulder with flashing lights includes up to a $10,000 fine, 2-year suspension of driving privileges and jail time, in extreme cases. The Illinois Tollway's 15-year, $14 billion capital program, Move Illinois: The Illinois Tollway Driving the Future, is improving mobility, relieving congestion, reducing pollution, creating as many as 120,000 jobs and linking economies throughout the region. The first six years of Move Illinois are on schedule and within budget, delivering the new Illinois Route 390 Tollway and a rebuilt and widened Jane Addams Memorial Tollway (I-90) with its new SmartRoad corridor, as well as opening a new interchange connecting the Tri-State Tollway (I-294) to I-57. Progress continues on projects addressing the remaining needs of the existing Tollway system, delivering the new I-490 Tollway Project and reconstruction of the Central Tri-State Tollway (I-294) and planning for emerging projects. The Illinois Tollway is a user-fee system that receives no state or federal funds for maintenance and operations. The agency maintains and operates 294 mi. of roadways in 12 counties in Northern Illinois, including the Reagan Memorial Tollway (I-88), the Veterans Memorial Tollway (I-355), the Jane Addams Memorial Tollway (I-90), the Tri-State Tollway (I-94/I-294/I-80) and the Illinois Route 390 Tollway.